Shopping malls across America are going to look a whole lot emptier soon. An exodus of giant retailers is beginning with the announcement of hundreds of store closures and thousands of people newly unemployed. The first of January, I broke with my usual tradition and wrote not about positive resolutions, but about the impending rockslide of the US economy. And “rockslide” is an apt word: as one thing starts rolling down the mountain, it will pick up other things until a veritable avalanche of other businesses and people are affected and rolling pell-mell right alongside. Sears has been around for 122 years, but it, too, is closing 235 under-performing stores. C. Wonder, the preppy retailer, is going out of business, closing all 11 of its U.S. stores in the next few weeks. Even holiday sales, normally high, plummeted this Christmas. 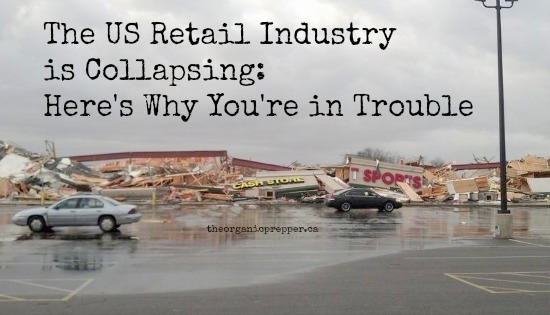 You may not work in retail yourself, but never doubt that the mass closure of these businesses will directly affect you..
Maybe you are wondering how. You aren’t much of a shopper. You aren’t a retail worker. Perhaps you believe you can compartmentalize this information, pack it away, and go on with your life as you always have. The thing is, it’s not just the patrons and employees of these stores who are affected. This is going to be catastrophic on a variety of levels. Think about the people who worked in these stores. Now, they’re without jobs. There will be more competition for the smaller number of jobs in America, and many people will not be able to find work. They’ll survive by going on assistance, draining the US coffers even more. As formerly employed people search for work that just isn’t there, we’ll see an increase in foreclosures, repossessions, and welfare. Think about those who provided the inventory for these stores. Yes, I know a lot of it was made in other countries. But, it was imported here and distributed here. Most businesses work on a “Net-30″ basis, meaning the inventory is delivered, and the payment for that inventory is due in 30 days. And guess what? The companies that imported the merchandise aren’t going to get paid. This will ripple through and cause other businesses to go under, which means still more people are unemployed. Think about those who transport the inventory. Trucking companies and the independent operators who drive the trucks won’t get money owed to them either. As companies struggle to keep trucks on the road, transport costs will go up, which will cause future inventory in stores to be priced higher. The price of everything is going to go up because wary distributors are going to try to recoup what they’ve lost from these companies that went under, while transporters increase prices to try to cover losses. Jobs will be even harder to get than they were previously – and looking at the unemployment rates, it was pretty darned difficult before. When people have no jobs, they spend no money, crushing the manufacturer’s and retailer’s economy even more. As financial desperation increases, so will crime. And it won’t just be property crime – expect an uptick in violence as property owners fight back. If you don’t live in an entirely self-sufficient bubble, you can bet you’ll be affected in one way or another. What can you do about the collapsing economy? Create multiple streams of income. We’d all like to feel like we’re reliably employed, but that’s just not true. You need only to look at the numbers above to see that jobs can be ephemeral. You need to be making money from more than one source (multiple streams of income). Start a small business that provides a safety net. Check out this great article on Graywolf Survival for more information on how to do it. Learn to shop wisely. A couple of years ago, I wrote this article about how shopping wisely can save you a fortune on your regular purchases. Each purchase needs to be thought out carefully because the day may come when your own personal economic collapse occurs in the form of a job loss, an illness, or a catastrophic bill. Build a pantry. A well-stocked larder can be your lifeline in the event that your personal finances take a hit. Your supply of food, toiletries, and household items can mean the difference between weathering a storm in relative comfort or going under completely. When I got laid off from my job in the automotive industry, it took 4 weeks before the severance pay arrived, and 9 weeks before my unemployment insurance kicked in. We were able to survive in total comfort due to the supplies we had laid in, and the lower amount of money I was receiving was enough to cover things like the mortgage, car payments, and utilities. Check out my book on building a one-year food supply in 3 months. Another option (although not as thrifty) is to stock up on freeze-dried food for your family. The nice thing is, you can put this at the back of your closet until the day you need it. It’s packaged for the long haul in buckets and it keeps for ages. Learn to do it yourself. Really, the epitome of preparedness is self-sufficiency. Only when you reduce your dependence on the economy can you be truly unaffected by the things going on in retail-land. Grow it, make it, build it. No matter where you live, you can take steps towards personal independence. The last half of this book is all about being as self-reliant as possible – it’s a must-read. Learn to live like there are no stores, and if a day comes when there aren’t, you’ll be just fine. Learn skills like canning, sewing , and homesteading , and figure out how to apply them to your personal situation. Also, don’t just learn them: DO THEM. Learn to live on less (and enjoy it). When my oldest daughter was a newborn, my husband lost his job. We went through the toughest financial period I ever faced. Quite literally, at one point we had 2 bags of bagels in our freezer, half a jar of peanut butter, and the desperate hope that our vegetable garden would produce enough to get us through until unemployment checks started arriving or a new job was found. I read a book (borrowed from the library and signed out for the maximum allowed number of times) that completely changed my life. If you haven’t read The Complete Tightwad Gazette, I strongly encourage you to read this gigantic bible of frugality from cover to cover. I still hear Amy Dacyzyn’s “voice” in my head sometimes and my own work is strongly influenced by those lessons she taught me back when I was a new mama. Here’s an article to get you in the frugal mindset. If you can’t protect it, you don’t own it. Lots of people hate this part, but it’s true. You absolutely must have a strategy for protecting your home and family. That means you need weapons. You need to figure out how to harden your property against attacks. You must be mentally and physically prepared for the increase in crime that comes with the increase in desperation. I know in my small, sleeping town, property crimes have been on the rise, and sadly, violent crimes are popping up now when they were so rare as to be an anomaly before. This article talks about hardening your home, and this one tells you how to prepare your home for battle, should things really go awry. Have you seen evidence of this collapse? How are things in your neck of the woods? I know that where I live, some of the nearby malls are turning into ghost towns. Crime has been steadily rising for the past six months. I personally know several people who have lost their jobs recently due to the closure of the businesses with whom they were employed. Have you seen evidence of this financial downturn? Let’s compare notes in the comments section below.